The navy stopped its rescue mission two weeks after the sub's disappearance. 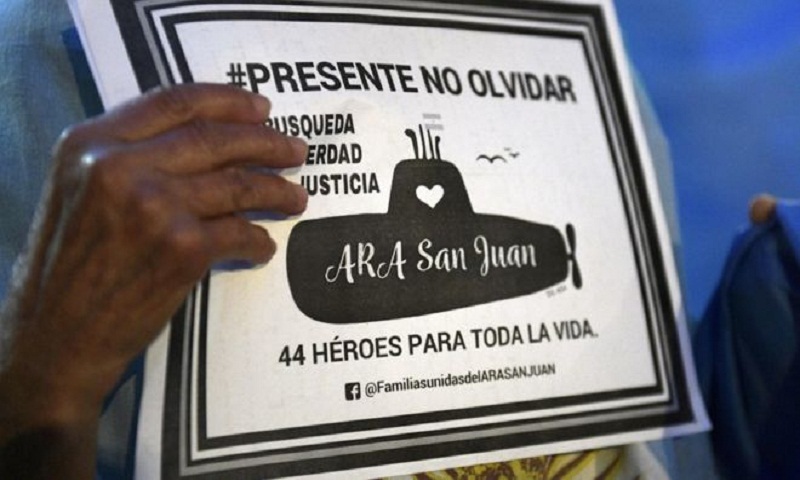 The ARA San Juan was returning from a routine mission to Ushuaia, near the southern tip of South America, when it reported an "electrical breakdown". According to naval commander Gabriel Galeazzi, the submarine surfaced and reported what was described as a "short circuit" in the vessel's batteries. The Argentine navy's last contact with the vessel was at approximately 07:30 (10:30 GMT) on 15 November, at which point its captain reportedly confirmed that the crew were well. Eight days after the sub vanished, the Vienna-based Comprehensive Nuclear Test-Ban Treaty Organisation said that it had detected a noise a few hours after the sub's last contact. The body, which operates a network of listening posts to monitor nuclear explosions, said that there had been a "hydro-acoustic anomaly" about 30 nautical miles (60km) north of the sub's last-known position at 10:31 (13:31 GMT). Navy spokesman Enrique Balbi told reporters last year that water had entered the submarine's snorkel, which can be used to take in air from above the surface when the submarine is submerged.